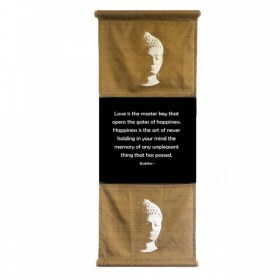 Love is the Master key..words from Buddha approx 27cm x 70cm (11" x 28")Perfect for Yoga studios or the special quiet spot in your home. Each banner is hand screened in family owned 'Fair Trade' home work shops. Each banner comes in its own fabric bag and is ready to hang. A wooden dowel top and bottom adds weight so that they hang nicely. Decorating with these banners provides a splash of colour as well as an inspiring message for yourself or others. Each banner comes in its own fabric bag and is ready to hang. opens the gates of happiness.